Join us for Latin Night with Sonido Costeno Live along with Dancer Elizabeth Magnani teaching you the latest salsa dance moves. 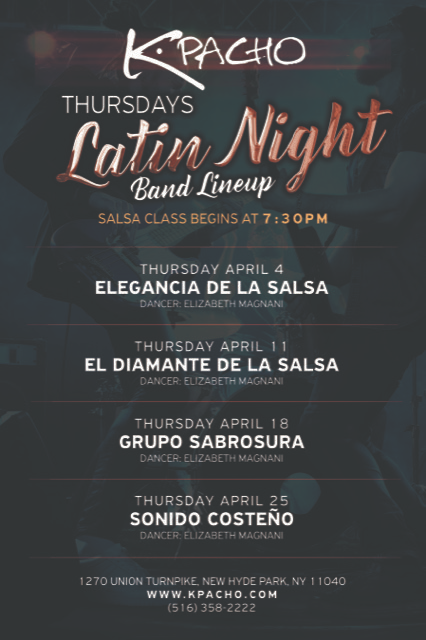 Every Thursday… Whether you’re an amateur or an advanced salsa dancer, patrons of all skill sets flock to bust a move to our live performances each week. If you’re new to salsa dancing, partake in an in-house lesson and get ready to show off. Come early and enjoy dinner before heading to the lounge and dancing the night away! Salsa class begins at 7:30pm the bands begin at 8pm.